I do not give performance guarantees because I provide the most flawed product known – people. I recently gave a seminar on how to design products using Thermoelectric Coolers (TECs). During this presentation, I showed the audience how to generate various tables and graphs using Excel data tables. I was surprised to learn that no one in the audience had ever seen an Excel data table in action. Since the middle of a seminar on TECs is probably not the best time to divert to some Excel training, I decided to prepare a simpler example that would be easier to understand on first exposure. My amateur astronomy activities soon provided me an excellent example. We often hear of Near-Earth Objects (NEOs) or asteroids in the press (Figure 1). The sizes of these objects are estimated using a simple formula that is based on the objects brightness (i.e. 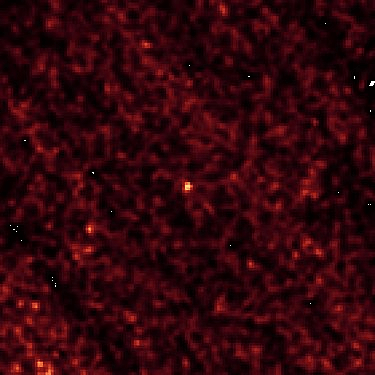 absolute magnitude) and the percentage of incident light it reflects (i.e. albedo) – a perfect application for a data table. You can skip the background material if you do not wish to know the details behind the formula used to create the data table. While crawling around the Jet Propulsion Laboratory web site on solar system objects, I found a table of asteroid sizes versus absolute visual magnitude and albedo. In this post, I will duplicate that JPL table using an Excel's data table, rounding to two significant digits, and custom format features. This example provides a useful vehicle for illustrating how to use an Excel for a typical scientific application – the evaluation of a two-variable function. The following definitions are repeated from this earlier blog post that was focused on using Mathcad. I smiled when I read this description of geometric albedo – it is VERY similar to the description of target strength as used by the sonar community. I am always amazed at the similarity between the various engineering and scientific disciplines. 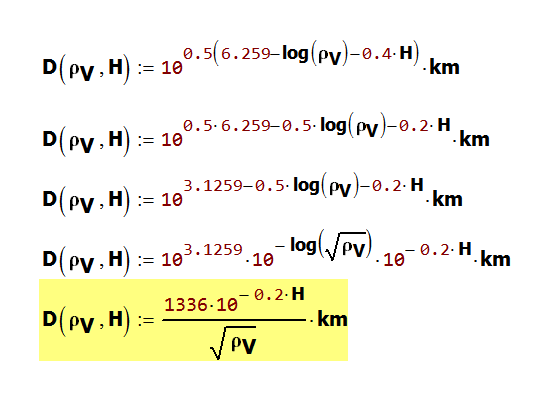 JPL uses Equation 1 to estimate an asteroid's equivalent spherical diameter. D is the equivalent spherical diameter of the asteroid [km]. pV is geometric albedo [dimensionless]. H is absolute magnitude of the asteroid [dimensionless]. I have never seen Equation 1 before, however I have seen Equation 2 in a number of papers and websites (example), including the Minor Planet Center. The detailed derivation of Equation 2 is a bit involved, but quite interesting. See this document for details (section 4.2). Equation 1 appears to be different from Equation 2, but simple algebraic manipulation shows it to be almost identical – only a minor difference in the leading coefficient. Figure 2: Equivalence of Equations 1 and 2. For my work here, I will use the JPL formula (Equation 1). The actual workbook is included here for those who wish to see the details. If you want a step-by-step guide to making a data table, see this video by Danny Rocks – a bit old, but I have always thought Danny gave the best tutorials. Figure 2: Good Video Briefing on Spreadsheet Work. The data table function will substitute all the albedo values in into the row input cell. The data table function will substitute all the magnitude data (H) into the column input cell. The function output goes into cell C16. I placed a reference to cell C16 in cell B18, which the data table function uses to obtain the table values. I covered B18 with a couple of text boxes so I could label the row and column data. As JPL did, I rounded the data to preserve 2 significant figures. I used a custom number form ("[<1]0.####_0;[<10]0.0_0;0_0") to ensure the data table results were in the same format as used by JPL. 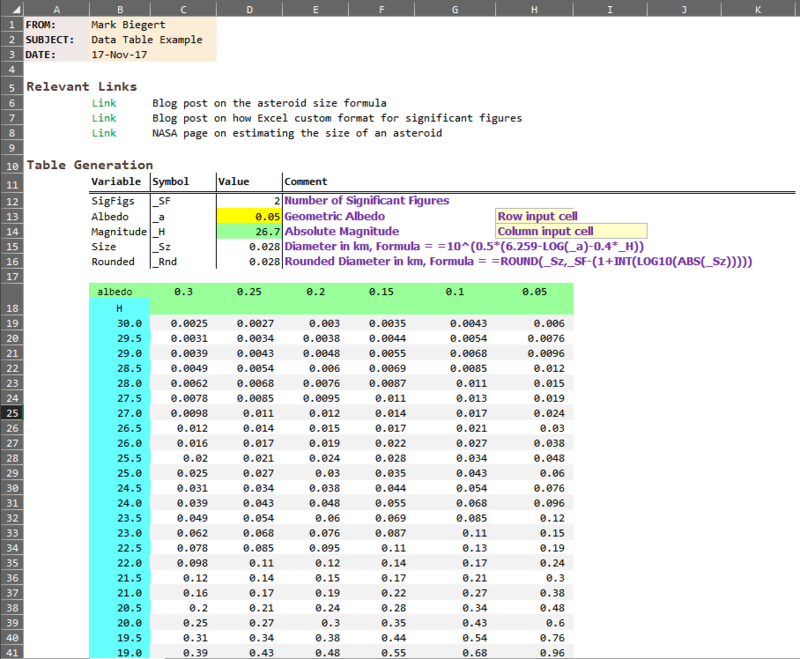 Figure 3: My Excel Data Table Example. I was able to duplicate JPL's table exactly using a data table, a custom format, and rounding to two significant digits. Here is the raw JPL table that I duplicated in Figure 3. Figure 4: JPL Asteroid Diameter vs Absolute Magnitude and Geometric Albedo. This entry was posted in Astronomy, Excel. Bookmark the permalink.